the temperature at which air becomes saturated by water vapor when cooled at a given moisture content and a constant pressure. The condensation of water vapor begins when the dew point is reached in the air or on objects in contact with the air. The dew point is one of the major characteristics of humidity and can be calculated from the temperature and humidity of the air or determined directly with a condensation hygrometer. If the relative humidity is less than 100 percent, the dew point is always less than the actual air temperature. The dew point decreases with decreasing relative humidity. At saturation, that is, at a relative humidity of 100 percent, the actual temperature coincides with the dew point. Thus, at a temperature of 15°C, the relative humidities of 100, 80, 60, and 40 percent correspond to the dew points of 15.0°, 11.6°, 7.3°, and 1.5°C, respectively. The temperature at which air becomes saturated when cooled without addition of moisture or change of pressure; any further cooling causes condensation. Also known as dew-point temperature. 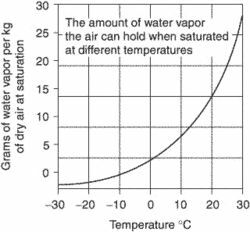 If the temperature is +30°C and there is 15 gm of water vapor per kg of dry air and the air is cooled to +20°C, saturation will occur. +20°C is the Dew point. Similarly, Dew point is +33°C if air with 5 gm of water vapor per kg is cooled till it becomes saturated. The temperature to which a given parcel of air must be cooled at constant pressure and constant-water-vapor content for saturation to occur. It is the temperature at which the saturation vapor pressure of the parcel is equal to the actual vapor pressure of the contained water vapor. Any further cooling usually results in the formation of dew or frost. Also called the dew-point temperature. When this temperature is below 0°C, it is sometimes called the frost point. Less overall power consumption, less purge-air consumption, constant and stable outlet pressure dew points as well as reduced operating and maintenance costs characterize this new CompAir dryer range. Two manifestations of Dew Point Evaporative Cooling are shown in Figure 4: (a) a Partial Extraction of Air arrangement, which fractions off a portion of the dry channel as usable product and (b) a Product Air Cooling arrangement which keeps working and product dry channels separated. The FINEDEW low dew point version (FDW20) can measure dew points as low as -55 degrees Celsius. According to the calculations, dew point of flue-gas water steam is 52. As was mentioned earlier, relative humidity, wet bulb, and dew point are all related. As it gets cooler and cooler through the night, it's getting closer to the dew point. Paddy Power: 4-9 Mega Delight; 7-2 Making Merry; 7 Blue Boomer; 10 Metric Tiger; 20 Quivers Beauty; 25 Dew Point. The RHS provides a steady stream of purified water vapor while maintaining a set dew point. Before we look at the dew point in detail, we must be aware that firstly, the higher the temperature of the air, the more water (vapour) can be absorbed by it; secondly, the maximum water content of the air therefore depends on the temperature; and, finally, the relationship of actual water in the air ([m.
5UT0 iTEC GmbH (formerly known as CS-iTEC GmbH) reports it is exhibiting several new products at Com Vac 24th-28th April in Hannover, including four mass flow sensors and a dual sensor ATEX/IECex dew point transmitter. In this study natural gas dehydration is investigated by condensation method in which water is separated from the wet natural gas by controlling dew point with the provision of cooling load. Typically the best dew point is towards the beginning of the "on-stream" time.